Abstract: Objective This study aims to compare radiosensitivity to γ ray between A549 and H460 cells and explore the relationship between different radiosensitivities and Nrf2 expression. 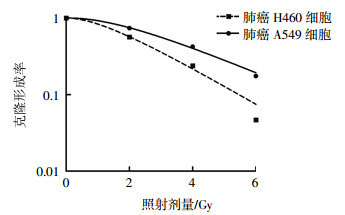 Methods A549 and H460 cells were exposed to 2, 4, and 6 Gy 137Cs γ ray, and H460 cells were exposed to 1, 2, 4, and 6 Gy 137Cs γ ray. Cell proliferation was assessed by clone formation assay. DNA damage was evaluated using comet assay. 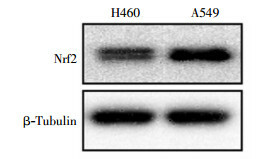 Nrf2 protein level was measured by Western blot analysis. Results Clone formation assay indicated that the clone formation rates of A549 cells were (73.78±14.69)%, (42.26±3.19)%, and (17.5±2.18)%, and those of H460 cells were (56.38±6.28)%, (23.82±8.25)%, and (4.66±0.87)% after exposure to 2, 4, and 6 Gy, respectively (t=7.99, P=0.015; t=6.75, P=0.019; t=12.03, P=0.005). Lung cancer H460 cells possessed higher olive tail moments (1.27±0.05), and tail DNA(4.51±0.19)% than A549 cells[0.68±0.04, (2.12±0.14)%] in the comet assay conducted 2 h after 4 Gy irradiation(t=8.69, 10.30, both P < 0.05). 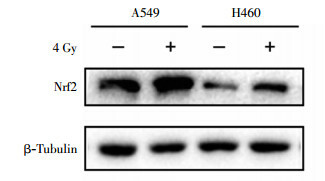 The Western blot assay indicated that the Nrf2 protein level was higher in A549 cells than in H460 cells. Radiation might induce the increase in the Nrf2 protein level in A549 and H460 cells. Moreover, the Nrf2 protein level was higher in radioresistant H460R cells than in radiosensitive H460 cells. 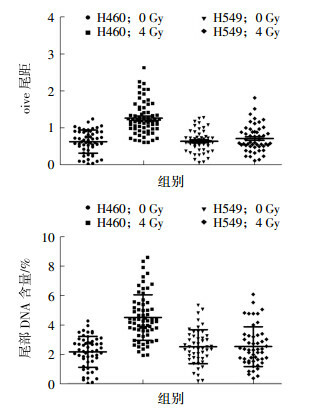 Conclusion A549 cells are more resistant to 137Cs γ ray than H460 cells, and different radiosensitivities may be related to Nrf2 protein level. 张海燕, 孟欣, 都镇先, 等. siNrf2对万珂诱导甲状腺癌细胞凋亡影响及其机制的探讨[J]. 中华肿瘤防治杂志, 2012, 19(3): 180–183, 196. Zhang HY, Meng X, Du ZX, et al. Effects of siNrf2 on apoptosis of thyroid cancer cells induced by bortezomib and its meohanism[J]. 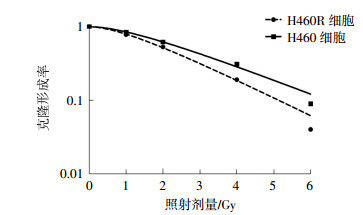 Chin J Cancer Prev Treat, 2012, 19(3): 180–183, 196.